I'm trying to figure out why the free space differs from when I look at the disks app to when I look at the files app. I'm relatively new to linux and I tried reading a tutorial on LVM but I couldn't figure this one out. Does anyone know why free space differs in these two contexts? EDIT 1: I understand the difference between GB and GiB. But even if I convert 17 GiB to GB, it comes out to about 18 GB, not 29 GB. This is why I'm getting confused when I look at the files app. I'm trying to figure out where the files app is getting that extra 10+ GB from. EDIT 2: After doing some research, I found that all of the sda2 device is full. This should not be the case. I haven't used up that much storage on my device. I've used up about 9 GB and sda2 is 20 GB. It's saying that I used up all of sda2 and most of sda3. These devices are both parents for my lvm. So now the question is, what's taking up so much storage and why isn't it being shown? UPDATE-SOLVED: Plain and simple, I was being really stupid and I forgot to expand the file system after I added another partition. Using these commands, I did some research. I found that the parents of my lvm are sda2 and sda3. The problem that I'm seeing is that sda2 is completely full for some reason. It shouldn't be full. I haven't used that much space. Also part of sda3 is used up for some reason. I've only used up about 9 GB not 18 or however much it's saying I used. can you add the output of lsblk to your question? In blivet-gui click on "fedora_localhost-live". You got two levels of free space. - The free space according to your disk partition table. 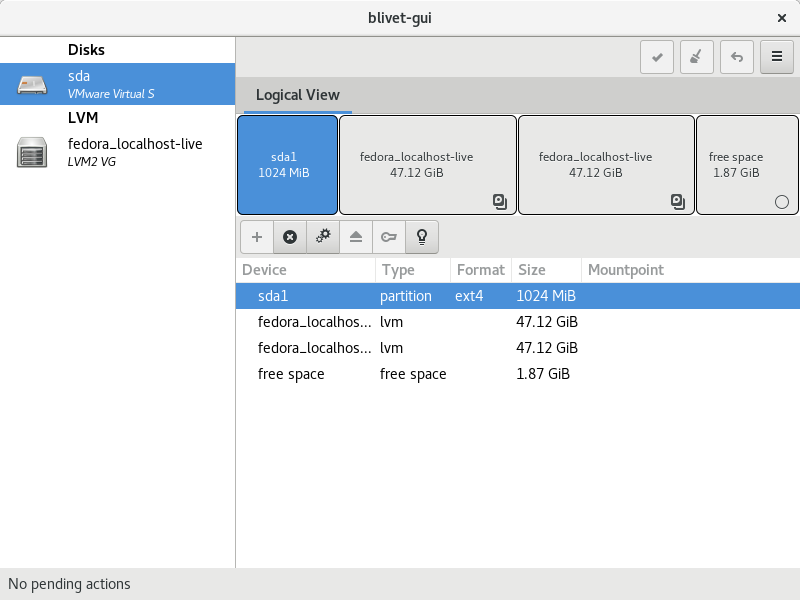 - The free space inside the LVM partition. 17 Gib is equal to 102410241024*17 = 18253611008 bytes which is 18.3 Gb. Then you also get slightly different results depending on how you calculate the free and used space. If I convert 17 GiB to GB, it comes out to about 18 GB. Not 29 GB. The files app says that I have 29 GB of free space, which is why I'm getting confused. I'm trying to figure out where it's getting that extra 10+ GB from. You got 18 GB out of the total 29GB free. That is: 29 GB total size and 18GB of those are free. It all fits quite nicely. My total drive size is 54 GB. Why is it that the system is only detecting 29 of them? Another very useful one is: lsblk! Is there a way I can see how much space my /home directory is taking up? The window is confusing to me as well so I filed a bug. The short hand notation we is: A / B available / Written out longer form it's : A of B is available on / Where A is what's available (free space) and B is total size of the volume mounted at / On my system, this exactly squares with df. And the units and values are SI, not IEC so that part is also correct.